Arrows point to progress of construction in Kuwait from May 3 (left) and May 25 (right). Brandli says soft-glowing areas represent burning gas from oilwells. Sharp-edged areas indicate lighting. Yellow lines are borders. On May 25, while scanning the Air Force Defense Meteorological Satellite Program images pipelined into his desktop from 450 miles in orbit, Hank Brandli skidded at a nighttime photo of Iraq. It looked familiar. But not exactly. Brandli retrieved another DMSP image he'd archived from May 3. He compared the two. The most recent photo showed a blazing corridor of light running the length of Kuwait, south to north, all the way to the Iraqi border. The image wasn't there on May 3. "It's going right up to Iraq's oil fields," says the retired Air Force colonel from his home in Palm Bay. "Maybe I'm full of s---. Maybe all they're doing is building a highway to put in McDonald's and sell hamburgers. But why go that way? I think we're in bed with Kuwait. I think we're pumping oil out of Iraq to pay for this war." That's an audacious observation. Especially considering those labyrinthine lines of exasperated motorists waiting to gas up at the fuel pumps in Baghdad. Not to mention the fact that Iraq's infrastructure officially won't be capable of exporting oil for another week or so. But as the May-June issue of Weatherwise magazine makes clear, Brandli isn't a conspiracy zealot squinting for guppies in the fig trees. An article titled "Weathering History" profiles the Vietnam veteran as a pioneer in satellite meteorology who was unable to discuss much of his defense work until 1995. That's the year President Clinton declassified vaults of Cold War satellite images. Now 63, the Massachusetts Institute of Technology alumnus isn't allowing multiple sclerosis to derail his passion for eye-in-the-sky technology. Three times a day, he checks his the latest unclassified downloads from American and Russian weather satellites filtering into his home-wired receivers. He found last month's DMSP nocturnal shots over Baghdad especially compelling. "You look for patterns. Patterns tell you things," says Brandli, who has masters degrees in meteorology, aeronautics and astronautics, and the author of "Satellite Meteorology" for the Air Force's Air Weather Service in 1976. "With night photos, you can distinguish natural gas burnoff, which looks globular, from city lights. And suddenly, over just a few weeks, we've got this straight line of lights leading all the way to those beautiful wells in southeastern Iraq. "If you're building pipelines, you've got to have power, you've got to have light -- trucks and personnel and food and all sorts of support. If I had to bet, I'd say it looks like we're running Iraqi oil through Kuwait. It would make sense, because Kuwait's got its infrastructure intact." At the State Department in Washington, D.C., David Staples on the Future of Iraqi Projects desk says he doesn't know if Iraq's oil is flowing into Kuwait. He referred the query to the Defense Department. A DoD spokesman suggested contacting the Office of Coalition of Provisional Authority (OCPA) in Baghdad. OCPA was not immediately available for comment. Either way, Gayikian has nothing but praise for Brandli's abilities. He was Brandli's commander at the Southeast Asia Tactical Forecast Center's intelligence compound in South Vietnam beginning in 1966. "Hank is one of the most knowledgeable people in satellite meteorology I've ever known," Gayikian says. "He's a real pro, and he's stuck with it. He'll always call to tell me about unusual satellite pictures he's just gotten his hands on." As the Weatherwise article makes clear, Brandli's judgment was a valued Pentagon asset during the Vietnam era. But the clandestine nature of his work often thrust him into thorny dilemmas, none more profound than the Apollo 11 splashdown in 1969. Four days before America's first moon walkers were scheduled to return to Earth, weather photos from classified DMSP spy technology -- far more advanced than NASA's resources -- indicated the astronauts' designated Pacific landing zone would be under siege from "screaming eagles." Screaming eagles are thunderheads peaking out at 50,000 feet; full blown, they could produce winds capable of shredding the Apollo capsule's parachutes and killing the crew. Under strict orders to share his photos with no one without "Special Access" badges, Brandli, then a meteorologist at Hickam Air Force Base in Hawaii, felt there was no time to work through the tedious chain of bureaucracy. So he briefed Fleet Weather Central commander Capt. Sam Houston in a parking lot, took him into the vault and showed him the screaming eagle photos. Unable to present the data as evidence, Houston nonetheless persuaded NASA to reconfigure a new landing zone and the Navy to reposition its recovery vessel, the USS Hornet, to safer waters. Houston never revealed where he got his information. Apollo 11 landed safely; sure enough, the original impact area became an untenable soup of dangerous wind and waves. "That's part of what makes Hank so good at what he does, his ability to win people over," says Frank Iverson, an Air Force colleague in Hawaii who now lives in Castle Rock, Colo. "He has this wonderful, contagious enthusiasm for his work. He always gets up for the big game. It's like the Super Bowl for him." Perhaps Brandli's Weatherwise tale, which discusses everything from cloud seeding in Vietnam to the recovery of "Corona" spy film ejected in tiny rocket canisters from satellites, will open up a new chapter in military history. "It's amazing to me," he says, "how many guys who've come up to me over the years and said, 'We read all these books on Vietnam, but nobody mentions the weather.' That's because it's been hushed up for so long. But with military operations, weather intelligence is always your first priority." By no accident, then, does Brandli view the world, including politics, through satellite meteorology. 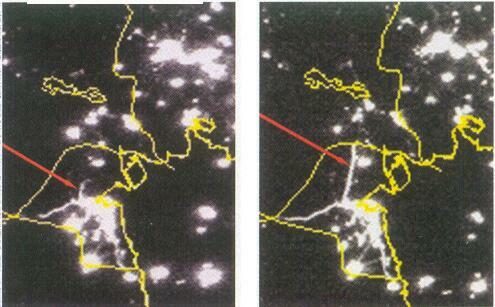 One of his favorite photos is a DMSP nighttime view of North Korea. Wedged against the glittering metropolitan constellations of China, South Korea and Japan, the totalitarian state of Kim Jong Il is little more than a year-zero black hole. "It's amazing to think about going to war with a country that's so bloody poor," Brandli says. "It's empty, it's vacant. They've got nothing. Not even electricity." Brandli even views the 9/11 terrorist attacks through the lens of weather. "They spent months, maybe years, planning this thing," he says. "But it had to come down to a last-second call, because there was a hurricane coming up the coast and a cold front moving out. "Think about it: September is the worst month in the world to be planning anything in the air on the East Coast, because you're at the height of hurricane season. In fact, climatologically speaking, Sept. 3 is the worst day of the entire year to plan a flight. And yet, you had this day where the weather was perfect, from Maine all the way down to Washington. You can't plan that far out and hope you get lucky. "What I'm saying is, I think they had a weather guy on their team to help set it up." Gee, I wonder who is building that "hiway"?